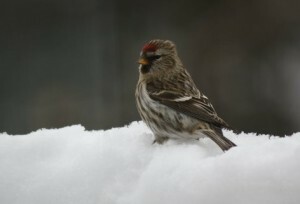 Winter provides a great opportunity for bird enthusiasts to attract birds to their own backyards. Due to the reduced food sources during these harsher months, many birds that overwinter in Canada rely heavily on bird feeders as their primary source of food. However, this benefit can also be a threat to the birds feeding, due to possible contamination by bacteria such as various Salmonella species and protozoan parasites such as Trichomonas species. In Ontario alone, the CCWHC has received numerous songbirds that have died due to Salmonella infections. The bird species can vary, depending on the year and location, but this year has been quite unsuitable for Common Redpolls. Infected birds can infect a feeder simply by using it. The bacteria can be on their feet and in their droppings, and will ultimately be ingested by other birds, infecting them and continuing the cycle. Worse still, the bacteria has tendency to move from one feeder to another by this form of transmission. In other areas of Canada, such as the Atlantic region, Trichomonas species also spread from feeders and affect numerous song birds, such as finches. Thankfully, you can help limit the spread of the pathogens. These simple steps will help to minimize the spread in your own backyard and help manage the spread to and from your neighbour’s feeder as well. It is best to clean your feeders at least once a week. Dispose of any remaining feed (and do not reuse feed after cleaning your feeder). Create a small amount of 10% bleach solution. That’s 9 parts water for each part bleach. Wearing proper gloves to protect your skin, scrub the bird feeder with the bleach solution. Be sure to give extra attention to any perches or food openings. Rinse the bird feeder thoroughly with clean water to ensure that there is no bleach solution left, and dry the feeder completely. Fill the feeder with only enough food to last approximately ONE week, as you do not want to waste extra feed that will need to be disposed of. If you find dead birds in your backyard, be sure to contact us and report your findings.